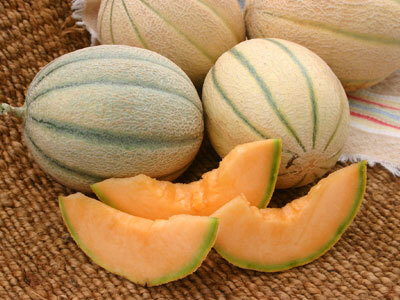 Honey Rock is a great tasting, early maturing heirloom melon with good yields of quality fruit. This melon variety produces compact 3-4 lbs fruits that are early to mature in just 80 days! Honey Rock’s flesh is a tender salmon-orange hue with a delicate sweet taste, no wonder it was an AAS winner for 1933! This small melon is a good size for an early melon. Melons provide a sweet and colorful addition to summer meals, and they can be grown in the home garden. In addition to the typical cantaloupe and honeydew melons, gardeners can grow other varieties such as banana melons. Before Planting: A light, well-drained soil with a pH of 7.0 and a southern exposure is ideal. Good soil moisture is important in early stages of growth and during pollination when fruits are setting. Planting: For direct seeding, sow 1-2 weeks after last frost when soil is warm, above 70°F, 3 seeds every 18″, 1/2″ deep, thinning to 1 plant/spot. Space rows 6′ apart. For transplanting, sow indoors in 3 weeks before last frost and transplanting outside. Plant 2-3 seeds per or pot, about 1/4″ deep. Keep temperature 80-90°F until germination. Handle young plants carefully and never let the soil dry out. Grow seedlings at 75°F. Reduce water and temperature for a week to harden seedlings. When the weather is frost-free, warm, and settled, transplant 2-3′ apart in rows 6′ apart or thin to 1 plant/pot or cell with scissors and transplant 18″ apart. Even hardened melon seedlings are tender. Do not disturb roots when transplanting, and water thoroughly. Watering: Melons need a steady supply of water, and soil needs to be damped but not flooded, approximately 1 inch a week. Fertilizer: Prior to planting, mix aged manure and compost into the soil. Melons are heavy feeders, so fertilize at planting and throughout the growing season with a 5-5-5 or 10-10-10 granular fertilizer. Do not let the granules come in contact with the plant. Days to Maturity: A ripe melon should be very easy to remove from the vine. 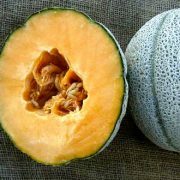 For a cantaloupe, the netting pattern on the melon becomes more visible and a crack appears at the base of the stem when it was ripe. 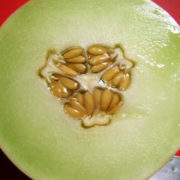 For a honeydew, the color becomes creamy. Most melon varieties are ready for harvest when the gray-green color begins to change to pale yellow and when a light tug separates the fruit from the vine. 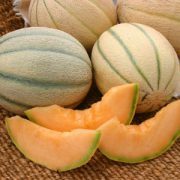 Some melon types, like honeydew, Charentais, canary, Spanish, and Crenshaw are overripe by the time the stem can be tugged from the fruit. Harvesting: Melons must be cut from the vine. All melons should be stored at 90% relative humidity. Store ripe melons at 40-45°F for 7-14 days. Tips: Cut off watering 1 week before harvest. This will give a more flavorful, concentrated melon. Over watering before harvest can cause bland taste. AVG. Direct Seeding Rate: 30 seeds/10′, 100 seeds/50′ 1M/500′, 15M/acre at 3 seeds every 18″ in rows 6′ apart.